They are skills anyone living in a city needs. Like taking strangers in stride. And taking noisy streets in stride. Riding calmly in elevators. Hopping in a cab. Hopping on the subway. And ignoring tempting food all around you. 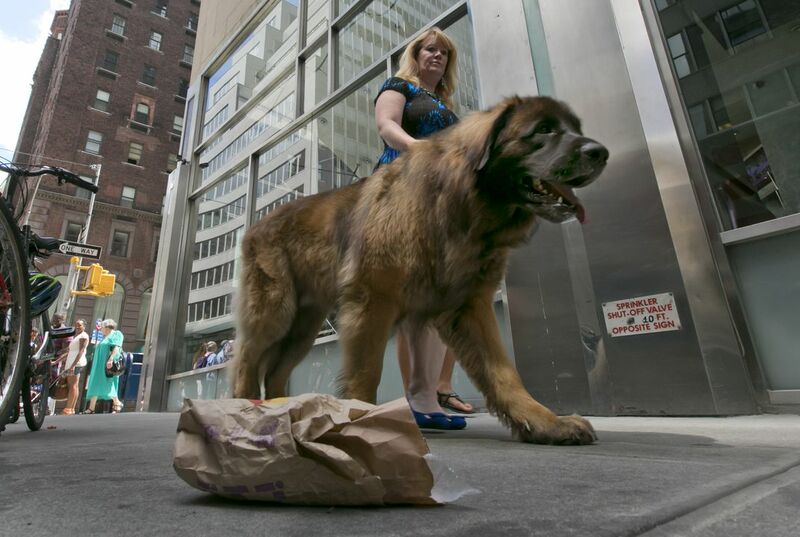 Magneto is a 170-pound dog. He is a Leonberger. He was out to show he could do all that. He walked along a crowded Manhattan street in New York this past week. He waited patiently with owner Morgan Avila for a light to change. He climbed in and out of a curbside car. And he ignored a fallen McDonald's bag. He also did not react to a hug from a passer-by. Magneto was officially said to be an "urban canine good citizen." That is the American Kennel Club's new title. It identifies proper city-dog behavior. "This ultimately will help the cause of dogs everywhere," said Mary Burch. She is the AKC training director. Americans are showing increasing interest in bringing dogs along in public settings. States including California, Florida and Maryland have started allowing dogs on restaurant patios. Similar laws are waiting to be sent to the governor of New York. Many dogs readily go with the flow of city life. But even dog fans agree there is room for some improvement. "It is more that the owners could step up their game," said Barbara Jaffe. She lives in Manhattan. That is in New York. She owns a Shih Tzu. Her name is Daisy. The dog freely showed her pet manners. Daisy was lying down calmly. This was while she was waiting for a train. It was at Penn Station. The AKC has offered a basic "canine good citizen" test for 25 years. More than 700,000 dogs have passed. The AKC added a more difficult "community canine" title last year. Those tests can be done at a dog show. They can also be done at a training center. The new urban exam takes place in "a more practical real-world setting," Burch said. It is open to both purebred and mixed-breed dogs. But it is no simple sit-and-stay test. The animals need to lie down. They must stay put for at least three minutes. This might be while their owner shops in a dog-friendly business. Or it might be when their owner snacks at an outdoor restaurant. About 500 dogs across the country have passed the test. That is since its April launch. About 70 million or more dogs have taken the test. Trainers estimate preparing takes at least a few months. But "it is fun. You're no longer just practicing 'sit' in the backyard," says Marti Hohmann. She is a trainer and examiner. She lives in Wellington, Florida. Sophie competes in obedience. She is a dachshund. The urban canine test posed other challenges. They included dealing with lots of people seeking to pet her. That is what her owner Catherine Anne Cassidy said. She lives in Tequesta, Florida. Cassidy said "Dogs have to know you and trust you really well" to pass. Her dog Sophie did pass. But "it will make everything so much easier. Like walking around the city with your dog." It may help at home too. Some homeowners' insurers have been more open to covering certain kinds of dogs. That is if they have the basic canine good citizen title, Burch said. 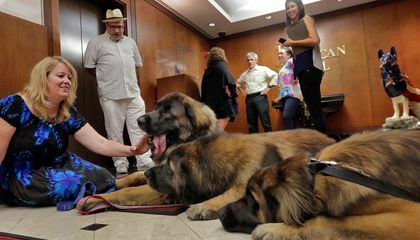 Barbara Fox says the city-canine title could help get a pet accepted at co-ops and condos. She is a New York real estate agent. She is also a dog rescuer. Burch added that buildings shouldn't demand that animals pass tests. Magneto sailed through. So did two of Avila's other Leonbergers. Their names are Hollywood and Mr. America. They are show and theater dogs. They have had plenty of training. Fans say any dog can and should try for the urban canine title. "Your dog will be better. You will be better. And you will be able to spend quality time with your dog doing things," Avila said.